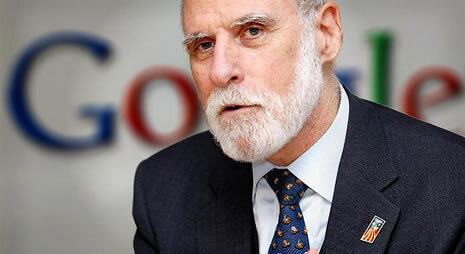 As a "father of the Internet," Vint Cerf enjoys extraordinary access to top policymakers. But whose interests is he advancing? Vint Cerf is one of a handful of people who legitimately can claim to have invented the Internet. He helped design the protocols and architecture for the network while working at the US government's Defense Advanced Research Projects Agency (DARPA). Later, he built the first commercial email service at telecom company MCI. With those credentials, Cerf commands widespread respect and has enjoyed easy access to top government officials and policymakers. In 2005, Google made Cerf a vice president of the company and gave him the lofty title of Chief Internet Evangelist, promising he would "continue his leadership in the Internet community." However, an in-depth examination of public records shows that Cerf often mixes corporate duties with his larger policy role in ways that are often hard to disentangle. The contacts raise questions about whether Cerf is acting as an advocate for good public policy or using his high-level contacts to advance Google's corporate interests. Cerf and Google didn't respond to a request for comment on his government contacts. Records show that Cerf has been a regular presence at the White House and throughout the federal government, especially during the eight years of the Obama administration. According to visitor logs, he has visited the White House at least 30 times since President Obama was sworn into office. Internal emails, obtained through open-records requests, show that Cerf has lobbied Obama administration officials on a broad range of issues of interest to Google, some of them with significant repercussions for the company's bottom line. He wrote to the chairman of the Federal Communications Commission about its proposed new rules on broadband privacy, met with the Commerce Secretary about copyright bills that Google staunchly opposed, and contacted White House officials about proposed net-neutrality regulations. Cerf forwarded a policy paper to White House officials, apparently to press the government to guarantee open access to the so-called middle-mile telecom infrastructure. That was a key policy priority for Google's broadband business, Google Fiber, which launched the same month. Google spends millions of dollars a year to lobby federal agencies on these and other issues. While Cerf has advocated before top administration officials on a wide range of public policy matters of importance to Google, he does not appear to have ever registered as a lobbyist for the company. In at least in one case, Cerf failed to file the required disclosures related to his advocacy. According to internal emails obtained by the nonprofit Electronic Privacy Information Center, Cerf contacted FCC Chairman Tom Wheeler in April 2016 “reacting to” its proposed rules governing the use of consumer data by broadband internet providers. The email was sent at a time when the FCC was actively engaged in the rulemaking process on an issue of importance to Google’s core business, which depends on being able to track users’ interests, behavior and movements to target advertising. In his non-public email communication with the FCC chairman, Cerf was also advancing Google’s longtime policy position—that IP addresses should not be considered personal information by regulators. By classifying IP addresses as non-personally-identifiable, Google was able to amass vast troves of user data and associate it with individuals. Cerf sparked controversy in 2013 by remarking that "privacy may actually be an anomaly." FCC "ex parte" rules require anyone seeking to comment on a proposed rulemaking to disclose any communications made privately with an agency official on a matter under review. EPIC alleged that the email exchange between Cerf and Wheeler was a secret and improper attempt by Google to influence the FCC’s privacy plan. “Everyone else has been very careful about their ex parte filings and here is a backdoor communication with the chairman by the top spokesperson for a key industry seeking to avoid coverage under the rule, which is of course precisely the reason for a public rulemaking,” EPIC’s Claire Gartland said. The Campaign for Accountability has written to the FCC’s general counsel calling for the apparent violation of the ex parte rules to be investigated. Cerf also appears to have helped coordinate the National Security Agency’s security cooperation with Google, a relationship that became a focus of controversy after Edward Snowden released documents purporting to show the agency had access to its users' data. In June 2009, Cerf wrote: “I am at NSA on Thursday to discuss cyber-security efforts by the agency with [then NSA director] Gen. [Keith] Alexander. Happy to summarize anything that appears to be useful. The idea apparently is to engage with industry to tackle IT security on many fronts.” A top secret document released by Snowden showed NSA had started collecting data from Google six months earlier. “I see ESF’s work as critical to the nation’s progress against the threat in cyberspace and really appreciate Vint Cerf, Eric Grosse and Adrian Ludwig’s contributions to these efforts during the past year,” wrote Gen. Alexander, mentioning two other Google employees. Cerf raised the ESF program in emails to the White House around that time, confirming his close involvement. Gen. Alexander portrayed ESF’s work as defensive. In June 2012, he told Google's Eric Schmidt that the group had helped secure the so-called BIOS of many computers—the foundational firmware that they depend on to run—against an unspecified threat. However, leaked documents showed the agency’s efforts in this area were also offensive: The NSA was revealed to have compromised the same BIOS system that Gen. Alexander boasted about protecting. It isn't clear if Google and Cerf aided the NSA's efforts to break into computers, or only its efforts to defend against such attacks from abroad. Cerf’s unusually close relationship with the Obama administration grew out of his early endorsement of the Barack Obama for president campaign in 2008. Soon after the election, Cerf was touted as a leading candidate for the new post of US chief technology officer. Although he wasn't chosen for that post, President Obama later appointed Cerf to the National Science Board in January 2013. Since Obama’s first days in office, Cerf regularly emailed top officials in the White House, especially those in the Office of Science and Technology Policy. One of his main contacts at the start of the administration was Andrew McLaughlin, a Google executive who was appointed deputy CTO at the White House in May 2009. According to emails released as part of an open-records request, Cerf was one of the Google employees McLaughlin communicated with most often. Emails show Cerf emailed McLaughlin about a range of official business, weighing-in on Internet governance issues and even suggesting ideas for possible executive orders by the president. On one occasion, Cerf contacted McLaughlin on whether the government should guarantee open access to so-called middle-mile telecom infrastructure, something Google had sought to aid its fledgling broadband business. Entry logs suggest the breadth of topics covered in Cerf’s more than 30 meetings at the White House. Some of those visits appear to have had a commercial flavor, potentially benefitting his employer by suggesting ways in which the government could use its products. For example, Cerf was on-hand when David Mihalchik, the Google executive charged with developing business from the federal government, met with Vivek Kundra, the White House chief information officer. Kundra was a strong advocate for Google Apps for Government, migrating the District of Columbia government to the software in 2009 as the District’s chief technology officer. In July of 2011, at Kundra’s behest, the General Services Administration (GSA) became the first federal agency to migrate its email services for its 17,000 employees to the cloud-based Google Apps for Government. Cerf also met twice, on September 28, 2009 and March 8, 2011, with US Chief Technology Officer Aneesh Chopra, an advocate for government innovation inspired by “private sector trailblazers” like Google. Cerf appears to have met with White House officials regarding international trade issues that could affect Google’s business interests. Two weeks prior to the European Commission’s decision to open an antitrust investigation into Google in November 2012, Cerf met one-on-one with Confidential Assistant to the Deputy US Trade Representative Allison Carragher. On April 25, 2013, Cerf dined with Miriam Sapiro, Deputy US Trade Representative overseeing USTR's activities in Europe, in the West Wing mess of the White House. Google’s supporters, including President Obama, have argued that the European antitrust cases against it are simply protectionism. Questions have been raised in some quarters about whether a Google executive, should be masterminding such a project. Cerf hasn't necessarily done anything improper by pressing top officials for specific government policies. But Americans and Internet users around the world are affected by those policies, and are entitled to know on whose behalf he is working. Registering as a lobbyist for Google is one way to do that. Working independently of Google, which has a significant business interest in these issues, would be another.